The Shoreline “B” Florida Vernacular home Available in February 2019 | 2,442 Sq.Ft | 4 Bed, 3.5 Bath, Study & Detached 2 Car Garage. 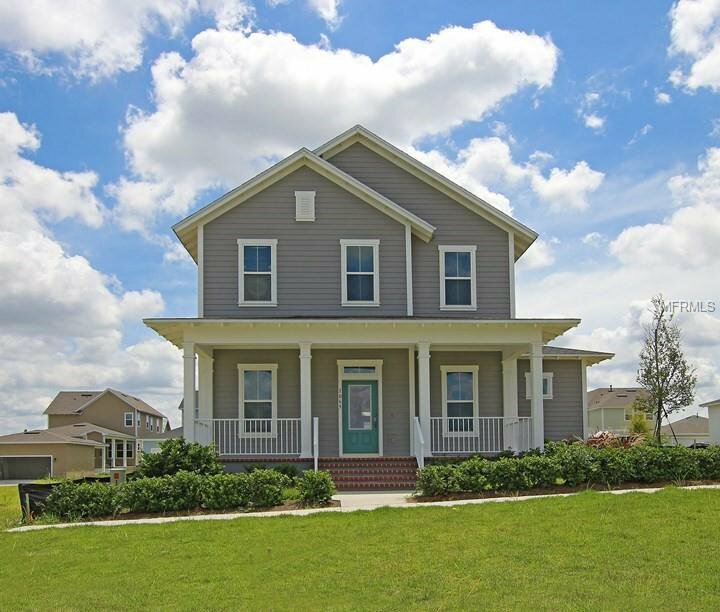 Enjoy this beautiful home with an Extended Front Porch overlooking the Park view! Walking distance to the new Clubhouse and Amenity Center. The Shoreline boasts Hardwood floors in the Entry way, Living room, Dining room, Kitchen and Mudroom. You’ll love the 42” Sonoma Painted Linen upper Cabinets, Stainless Steel appliances and the large Granite Kitchen Island which offers plenty of seating, allowing a sociable host to gather with friends and family. And, after a night of hosting, this home offers a large Master bedroom allowing you to relax and unwind. Feel confident buying your next home from the largest privately-held home builder in America because of our 40-year reputation for delivering quality new homes, customer satisfaction and warranty service. Listing courtesy of WEEKLEY HOMES REALTY COMPANY. Selling Office: COLDWELL BANKER RESIDENTIAL RE.